Would you like to win a lovely big stack of freakishly fun new books? 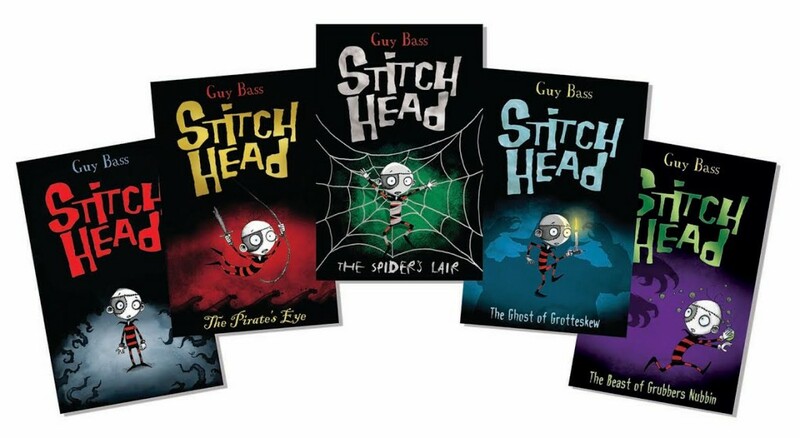 To celebrate the latest edition of the Stitch Head series of books by Guy Bass, we’ve got a great giveaway for two lucky readers to win the full set. In The Beast of Grubbers Nubbin , released by Stripes Publishing on 1st June 2015, the orphans at Castle Grotteskew are running riot … and getting hungry. With no food in the castle, Stitch Head and Arabella head down to Grubbers Nubbin to see what they can pilfer, but there they encounter a terrifying, savage beast. Could one of Professor Erasmus’s monstrous creations be on the loose…? Funny, accessible, fast-paced and illustrated throughout by Pete Williamson, Guy Bass spins an atmospheric tale for both boys and girls of 8 years old and over. Guy Bass is an award-winning author whose children’s books include Secret Santa and the Legend of Frog series. In 2010, Dinkin Dings and the Frightening Things won the CBBC Blue Peter Book Award in the ‘Most Fun Story with Pictures’ category. He has written plays for both adults and children, been a theatre producer and an illustrator. Guy lives in London with his wife. The Stitch Head series is sold across the world and been translated into 13 languages. Prize value is over £25. These books are suitable for readers aged 8 and over. I would love to win these books for my two boys – they love scary/spooky stories! Thank you! I would love to win for my kids! I would love to win these for my son as he would love these. I’d like to win for either my nephew or my daughter. My son loves reading, these would be perfect for him. My son read his first book over half term and is gaggin to get his hands on more books. I think this is awesome! He’d love these books. I’d probably read them too…. my son’s just recently got into reading Guy Bass books and as it’s his birthday this month, this would make an awesome surprise for him! My 8 year old daughter LOVES reading, she’s currently reading Ronald dahls twits and will shortly be needing new books to read. I would like to win as I think these books will catch my grandsons imagination. Finding interesting books for my eldest is becoming quite difficult. These look just the ticket! I want to win the books as a present for my nephew. i think my grandaughter would love these! I haven’t read these books but some people in my class have and I would love to try them out myself. because my son would like these. I’d like to win to give this to my Daughter as a treat! id love to win these books because they look so cool. I’m building up my daughters’ collection for when they’re bigger and I read anything so am bound to enjoy these! I want to win these books for my daughter who loves reading- she could read before she went to school!! I would like to win because boys need lots of encouragement to read and these would be great. The children and I all love to read to ourselves and to each other. My daughter loves reading at bedtime so this would make her very happy. My son would really enjoy these books. My son is an avid reader and this looks like his sort of thing. Would love to win to add to my daughters collection of books. Because they look awesome for my little boy Jake. I would love to win because these look like fabulous books 🙂 I’ve not come across them before!